Progressive jackpots are what all pokie players dream about. With massive payouts, commonly in the millions, progressive jackpot wins are similar to winning the lotto. Game manufacturers nowadays are able to offer huge jackpot amounts, and such games have fast become one of the most popular styles of online pokies. A network of slot machine games, either within a casino or across different casinos (online or offline), are often linked, so every time a player plays on these machines, a certain amount is contributed towards one large lump sum – the jackpot. Otherwise, individual games will often have their own constantly increasing jackpots. As more and more people play, the cash prize steadily grows. Think of this like the jackpot amounts in a lotto game, which roll over and increase every week, if nobody hits the winning numbers that week. Progressive jackpot pokies work in the same manner. The jackpot is won when a player hits the winning combination with the highest payout – usually a combination of rare and valuable symbols. Once a jackpot is won, the prize is reset back to a pre-set amount. As the jackpot amount increases every time a game is played, the casino will normally contribute some of the profit of a linked machine to attract players. Winning the jackpot is no easy feat, however. Normally, we need to wager the maximum number of credits per play to have a chance at winning the highest prize. Any losses contribute to the overall jackpot. Games which have a larger credit wager tend to have a larger jackpot, and visa versa. Below we have listed some of the best progressives online – we will continually update this list as new and exciting titles from Microgaming, BetSoft, NetEntertainment and other gaming software developers are released for Australians. 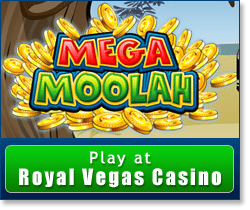 Mega Moolah is the most popular progressive slot game on the Internet, with some of the largest jackpots on offer, found at almost every top online casino site. Mega Moolah features 25 pay-lines and allows players to choose their own coin denominations to suit their style of game-play. The game itself has a fun safari theme with animals decorating the reels, and a wild symbol of a lion. The lion acts as a multiplier and doubles payouts when spun, and helps attain the combinations needed to win big. Instant payouts, bonus rounds and free spins are also available. Major Millions is a five-reel progressive jackpot game with 15 pay-lines. Also developed by Microgaming, Major Millions features a military theme and is an extremely popular game, offering enticing cash rewards on regular spins, and numerous exciting bonus features including multipliers and scatter icons. To have a chance at winning the huge jackpot, players are required to bet across all pay-lines with a maximum wager. The jackpot is won when all five wild symbols appear on the 15th payline. Treasure Nile is an Egyptian-based slot game with great graphics and sound effects. The symbols on the reels include King Tut, jewellery, cobra snakes, pyramids and more. Also a five-reel video pokie, Treasure Nile is an affordable progressive jackpot game with only nine pay-lines. This game’s wild symbol is a pyramid. Scatter icons are also present – a scarab beetle symbol. Place the maximum bet to qualify for the jackpot. King Cashalot is a five-reel, nine-payline progressive slot game, and Sir King Cashalot is keen to hand out as much money as possible. With a jackpot starting at no less than $300,000, simply wager the maximum credits (only $2.25) and if you line up five King symbols on the ninth payline, the progressive jackpot is yours. Additionally, three Dragons will activate the Treasure bonus game where you pick a random treasure chest – one which could contain up to 24 times your total wager amount. Cash Splash is another popular progressive which showcases three reels – a rarity for most progressive jackpot pokies. It has 15 pay-lines and a fixed coin size. Players are required to place a maximum bet per spin to qualify for the jackpot. There are up to 36 winning combinations, with wild symbols which better your winning chances. With its affordable format and simple three-reel design, Cash Splash is widely popular for traditional pokie fans. *The Royal Vegas Casino market app is branded Regal Vegas Casino in all app stores (Google Play, the Apple App Store, Blackberry World, Windows Phone Apps + Games Store, etcetera). This if for marketing purposes, and is the correct application to install – once installed, players have the choice to play for free or real money in Australian currency.